Lasting over 20 years without maintenance. 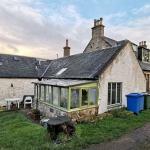 As it's colored in mass, no finishing plaster or painting is necessary, saving time and money upon application. Available in 24 different colours, with other custom colours available at the customer's request. Important: The application of RINZAFFO MGN is necessary as a base / scratch coat and adhesion bridge on all mixed substrates, on reinforced concrete or perforated bricks, or if rising damp is present or suspected. Mix the contents of the RINZAFFO MGN bag with clean water to obtain a consistent mortar. 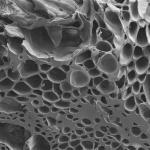 Cover the entire surface with a minimum thickness of 5 mm of RINZAFFO. Wait for the scratch coat to set before proceeding with the SANACOLOR 2000. In the presence of rising damp apply the base coat to a height of 1 m above the dampness line or level of visual degradation as described in the RINZAFFO MGN technical sheet (restoration steps 1 and 2), then wait for 48 hours before applying the Sanacolor 2000 coat. 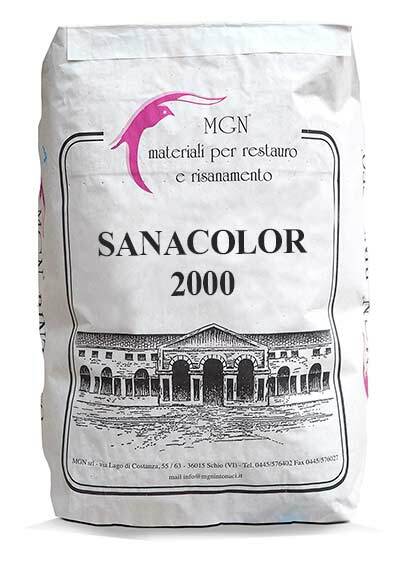 Mix the contents of the SANACOLOR 2000 MGN bag with clean water. Apply a first coat of about 10 mm and level the surface. Wait for the first coat to dry and apply a second "finishing" coat of approx. 4 mm. 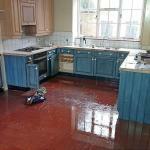 Finish off the surface with a sponge or hard trowel depending whether you prefer a rougher or smoother finish. If greater thickness is needed, additional coats can be added after the first coat, allowing enough time for the previous coat to set. Once the desired thickness is reached let the plaster body to dry, then apply the last (finishing) layer as described in the previous paragraph. If you wish to further protect the walls from rainwater, apply hydrophobic protection. 24 standard colours available, from light to dark tints - some of them are shown below. Custom colours can also be prepared upon request.